September 25th in Premium Themes, Themes for Pro Bloggers by Wordpress Jedi . There are lots of people who use WordPress to run their blogs. Many use free WordPress themes while others go with custom design ones. Custom design themes can be very expensive and outside of many bloggers’ price range. That’s where premium themes such as Caulk come into play. They may not give you an exclusive look and feel right out of the box, but they are attractive and can be customized to look unique on your website. Caulk theme is one of the sleek blogging themes on the market that is media friendly and lets you offer a more dynamic reading experience to your audience. 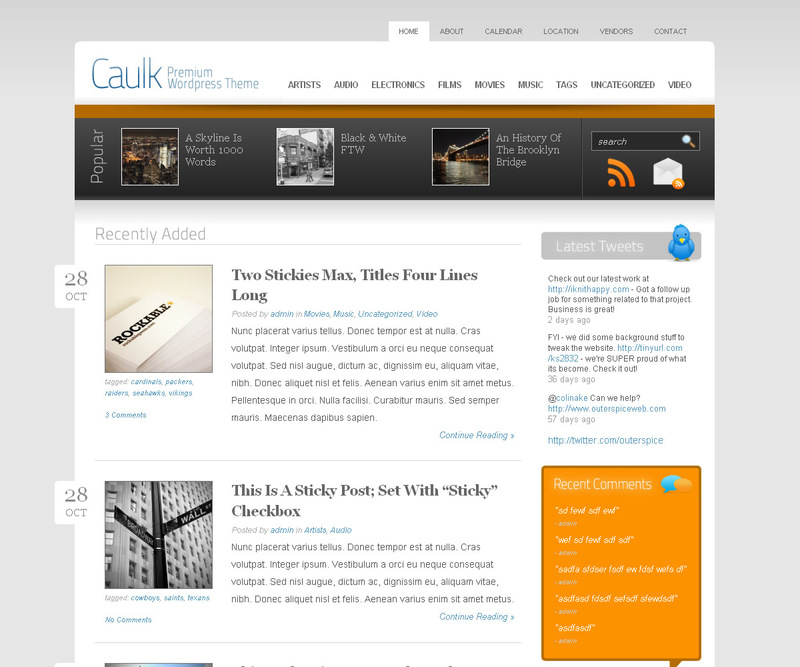 Caulk can be used for personal blogs and magazine type websites. It has a pretty dynamic featured section that presents your articles in a super attractive fashion. You also have a popular post section right under the jQuery slider, giving you even more ways to promote your top posts. Caulk has 8 color schemes that you can easily play with in the back-end. Caulk is ad and social media ready. It has a very attractive layout (w/ social buttons) for your visitors to take advantage of to share their favorite posts. Your related posts and their thumbnails are displayed after each post. Twitter is integrated into this theme too. Caulk may be a very sleek theme, but I like it for its degree of customizability. 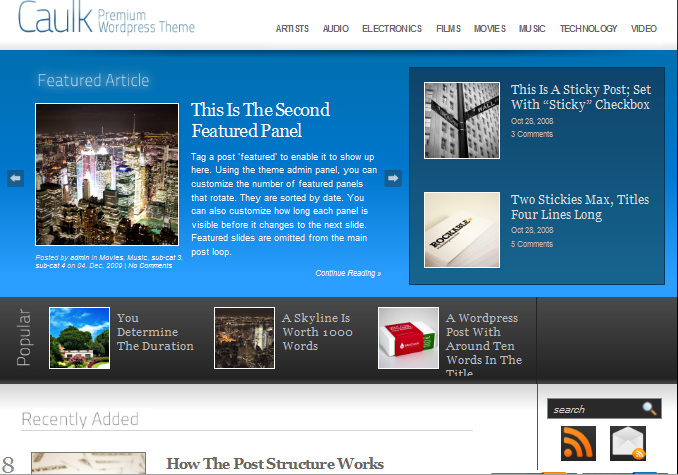 You can show and hide various sections to make the theme fit your blog’s needs. A custom logo can be easily added to this theme too. It may not be the most expensive theme on the market, but Caulk does offer a lot of bang for buck.